New Zealand's European tour began with a 26-19 victory over France in Paris on Saturday - ahead of a clash with "real edge" against England at Twickenham. The All Blacks will be defending a 100% win record in 2013 on Saturday at a venue where they lost 38-21 last year. 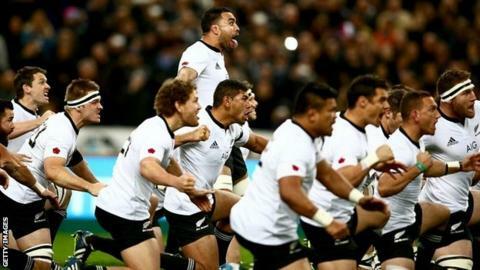 "They're talking about scoring four tries and going to number two in the world," All Blacks coach Steve Hansen said. "They've got a lot of confidence. "There's a real edge going back to Twickenham." England followed up their victory over Australia by defeating Argentina 31-12 on Saturday, and Hansen added: "They're going well, we're going OK. Both teams are looking forward to playing there." Saturday's win in Paris was New Zealand's 12th in succession this year, but captain Richie McCaw said the players had been frustrated by their inability to really let loose against an effective French team that attacked them at will and regularly broke the gainline. The All Blacks made the difference in the first 20 minutes of the second half when tries from Charles Piutau and Kieran Read, thanks to an ingenious pass from Piutau, opened up a 14-point lead before Brice Dulin's score set up a nervy finale. "Probably the one thing was the set-piece, especially the scrum. At times under foot it didn't help," said McCaw. "We were just frustrated we made mistakes at critical times and ended up on defence when we had the chance to put pressure on. At the end we were defending because of poor skill execution." France coach Philippe Saint-Andre was philosophical about another defeat in a year that has seen them win just once in nine matches - and lose four times to New Zealand. He said: "I think about the record they're on - they played 31 games, won 29, drew one and lost one - so it must be the best record in the history of rugby." Meanwhile, Australia bounced back from last week's 20-13 defeat by England to trounce Italy 50-20 at the Stadio Olimpico in Rome on Saturday with winger Nick Cummins scoring two of the Wallabies' seven tries.